The treatment of a Briton on Ethiopia’s death row is threatening to undermine the country’s relationship with the UK, the foreign secretary has warned. 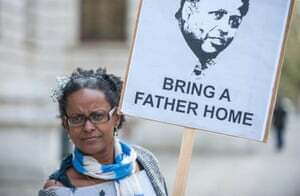 In an unusually blunt statement, Philip Hammond has called for rapid progress on the case of Andargachew Tsige, who is being held in solitary confinement in an unknown location in Ethiopia. The foreign secretary’s comments, released a year after Tsige was abducted while transiting through Yemen, is a clear sign of official disapproval of the approach taken by the regime in Addis Abbaba. The Foreign Office is escalating the case beyond confidential diplomatic exchanges. On Wednesday, Hammond spoke to the Ethiopian foreign minister, Dr Tedros Adhanom Ghebreyesus, about the case on the phone. 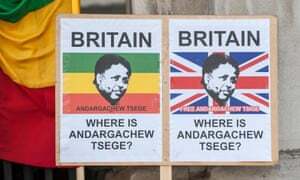 His statement said: “I am deeply concerned that, a year after he was first detained, British national Andargachew Tsige remains in solitary confinement in Ethiopia without a legal process to challenge his detention. 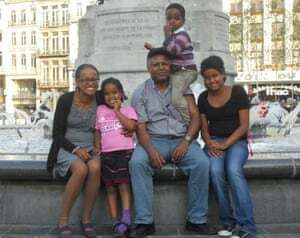 Tsige’s partner, Yemi Hailemariam, also a British national, lives in London with their three children. She has spoken to him only once by telephone since his abduction. “He’s in prison but we have no idea where he is being held,” she told the Guardian last month. “He said he was okay, but I’m sure the call was being listened to. He had been in Dubai and was flying on to Eritrea when the plane stopped over in Yemen. He hadn’t even been through immigration. We think Yemeni security took him and handed him over to the Ethiopians. “They say there was an extradition agreement, but it was so quick there was no time for any semblance of a legal hearing. Yemen and Ethiopia had close relations then. The [Ethiopian] government have put him on television three times in heavily edited interviews, saying he was revealing secrets. Tsige, 60 – known as Andy – had previously been secretary general of Ginbot 7, a political opposition party that called for democracy, free elections and civil rights. He first came to the UK in 1979. The Ethiopian government has accused him of being a terrorist. In 2009, he was tried with others in his absence and sentenced to death. The latest reports had suggested that his health is deteriorating. Juan Mendez, the UN special rapporteur on torture, has written to the Ethiopian and UK governments saying he is investigating Tsige’s treatment. There are claims Tsige is being deprived of sleep and held in isolation. Daryl Hannah: Solitary confinement is scary! Posted on 25th June 2015 by newsafrica. This entry was posted in Africa, Ethiopia and tagged Addis Ababa, Africa, British nationality law, Eritrea, Ethiopia, Foreign and Commonwealth Office, London, Politics of Ethiopia, Secretary of State for Foreign and Commonwealth Affairs, United Kingdom. Bookmark the permalink.